The winter solstice is the shortest day and the longest night in the northern hemisphere. This year, the date is December 22. The winter solstice is regarded as an important day in many places around the world. It is considered the day when the sun is reborn because each day gets longer after the solstice. The winter solstice is expressed as "Ichiyou Raifuku" in Japanese, meaning the turning point from Yin to Yang--Yin and Yang are the positive and the negative in the principles of Chinese philosophy. It also means the day of "the return of spring," when winter has gone and spring comes. Actually, it becomes much colder after the winter solstice. In Japan, many practices to warm up and take care of ourselves have been passed on since the old days. 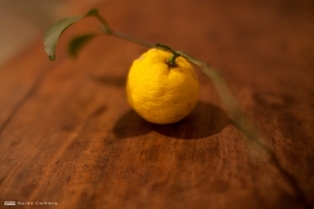 One of the widespread practices is taking "yuzu-yu." Several slices or a whole "yuzu," a kind of citrus, is put in a cloth bag, then the bag is placed into bathwater. It is said in Japan that if you take a yuzu bath on the winter solstice, you will never catch a cold during winter. It is also said that the strong smell of yuzu can remove evil from the body and purify it. In fact, yuzu baths smell good and an ingredient of the yuzu skin is known to be good for skin protection. Another well-known practice is to eat "kabocha," or winter squash, on the day of the winter solstice. Japanese winter squash is full of vitamin A and carotene and thus good for preventing colds and strokes. Although the harvesting season of squash is from summer to autumn, it can be well preserved and thus valued in winter when other vegetables are scarce. In addition, the phonetic sound of "kabocha," also read as "nan-ki-n", is said to be auspicious. The sound, "n" is a rhyme for "u-n" (meaning fortune in Japanese) and therefore some vegetables that end in "n," like "dai-kon" (Japanese radishes), nin-jin (carrots) and ren-kon (lotus roots) are also regarded as auspicious vegetables. There are some shrine festivals related to the winter solstice in Japan. One is "Toji-sai," the Winter Solstice Festival, held by the Issan Shrine in Saitama City in Saitama Prefecture. At the shrine, they make a path in the middle of a bonfire. The practice is called "hi-watari," or firewalking in English. Visitors walk down the path barefoot, wishing for the removal of impurities of the past year, and for good health and family safety for the coming year. After they safely finish their firewalking, yuzu fruit is given to the visitors. Thus, the festival is also called "Yuzu Festival."